Hi. Im writing from the ferry dock on middle bass island. Fun day of botanizing on lake erie. Update: I'm back in the hotel. I sent that quick update from my cellphone. It took all I had to type that out on my non-querwty keyboard phone. I'm done with my work trip, and now I'm free to spend time with Megan, Weston, and my parents and brother here in the Lake Erie Islands region. Usually I'm up and back to Columbus in the same day- I must say it is nice to watch the sunset, which we have a wonderful view of right out of our hotel window. Botanizing today was fair. No major discoveries, although the island did have a few nice wetlands. Tomorrow, we're off to Firelands winery for a tasting and tour (Megan loves factory tours- ask her about all the ones she's been on through the years). Tomorrow afternoon, we might hit Lakeside and the Marblehead region. I'd like to show Megan the quarries and Lakeside Daisy State Nature Preserve. Weston is doing fairly well, although he woke up last night at 3, with a full diaper. That's what we get for putting him to bed in the "poop on Michigan" onesie! "Doesn't Middle Bass have an old winery on it? I think I have an old photo somewhere. Lake Erie in that area is very interesting." Yes Mary, it sure does. 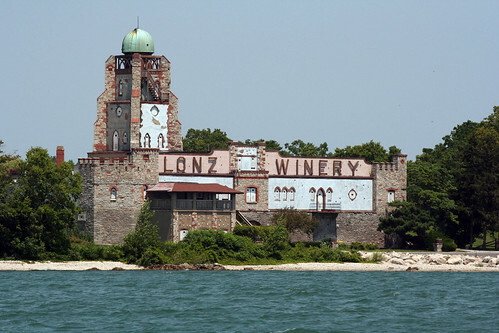 It's the old Lonz Winery and is now owned by the State of Ohio. Here's an image of the eclectic looking winery, which, according to Wikipedia, hosted five presidents. It is now shuttered, waiting for its next phase of life. I've added a creative commons image of the winery, it still looks the same today. Doesn't Middle Bass have an old winery on it? I think I have an old photo somewhere. Lake Erie in that area is very interesting. I really miss going up there for vacations now that my parents are gone. Laughed about Weston's diaper...that will teach you to plant suggestions in his mind. Mary- You are correct- the old Lonz Winery. The building and grounds, and the harbor have been purchased by the State, and a new marina is currently being developed. You should make it up again someday, you may not recognize them- lots of development has gone on. You always go to the coolest places! Tom- I'm lucky. But I do have to travel a ton, and right now, I'm pretty worn out.